New to the sales market, the 37m sailing yacht YII is also now available for charter with Barbara Muller at Ocean Independence. A fast cruising sloop, she was launched in 2006 by Holland Jachtbouw with naval architecture by Dixon Yacht Design and interiors by John Munford. The interior is both modern and warm with an intelligent use of pear and wenge woods to contrast against light white panels and woven leather inserts. YII sleeps up to 6 guests in 3 cabins located forward, including a generous master suite. 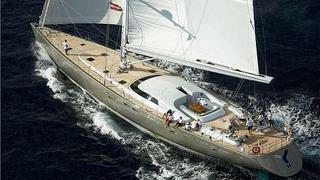 Weekly charter rates on YII start at €70,000 under MYBA terms.